The School was founded with commitment to the vision of bringing surfing within the reach of anyone who has the desire. We have developed a method of teaching surfing that is safe, easy, & fun with a strong emphasis on knowledge & positive encouragement. Today, keeping with that commitment we have a dedicated staff of experienced and highly qualified Surf Instructors who are great surfers and even better teachers. We believe in continued education for all staff members for ocean awareness and ocean safety. 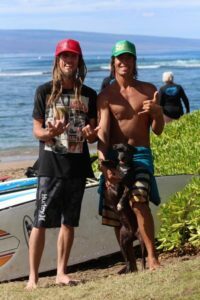 We believe in building a good foundation for surfing through proper technique, incorporating ocean awareness, water safety, and surfing etiquette. We have a method of teaching that surpasses all industry standards, helping people of all ages learn to surf, guiding novice surfers down a path of achievement and teaching technique and style to all those who come to experience the joy of surfing with us. We are passionate and dedicated to teaching, sharing knowledge and providing a quality experience to each and every one of our clients who travel from all around the world to learn the sport of surfing here in its birthplace of Hawaii.